Heres a superb new online slots game from the team at Yggdrasil Gaming, learn more about Easy Slots click here. 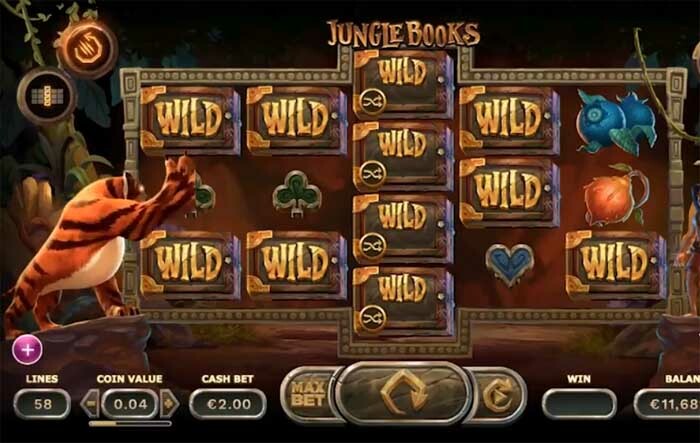 This epic online slots game is based on no other than Rudyard Kipling's beloved novel “The Jungle Book”. The story entails of a young boy called Mogwli and his endeavors in an Indian jungle. Mogwli has been raised by a pack of wolves and across his adventure, he comes across a series of talking animals such as ‘Baloo the Bear’, ‘Bagheera the Black Panther’, ‘Kaa the snake’ and ‘Shere Khan the Tiger’. These well-loved animals have brought joy and laughter to households worldwide, which is why we have brought them back to life in our epic online slots game “Jungle Books”, developed by “Yggsdrasil”. So if you fancy yourself to be a king of the spinners or a slots game VIP, then this could be the game for you. With fantastic bonus rounds such as: ‘synced reels’, ‘spreading wilds’, ‘win both ways’ and ‘x3 wilds’, today could be your lucky day. If you want some casino promos then Easy Slots has loads on offer! Yggdrasil Gaming is renowned for producing some of the best slot games around. spin slot games now! The aim of the game is to collect as many coins as you can, as you swing through the realms of this online slots game. The coin system is ranked in chronological order: collect a symbol three, four and five times for a coin reward, the coin reward becomes greater for each symbol collected (maximum five). The symbols are broken down into low pay and high pay symbols. The low symbols consist of the card suites: clubs, hearts, diamonds and spades, with the coin reward ranging from 3 coins to 25 coins. The high pay symbols comprise of five different colour jungle fruits, ranging from a reward of 9 to 100 coins. The developers also added a super high pay symbol! Collect the Pear symbol to receive a reward from 50 to 300 coin reward. · Win Both Ways, this is when all lines pay from both sides. · Spreading Wilds, this is when each wild spreads, creating one or two extra wilds in random positions. Discover how to pay with phone credit casino and you'll start smiling too!